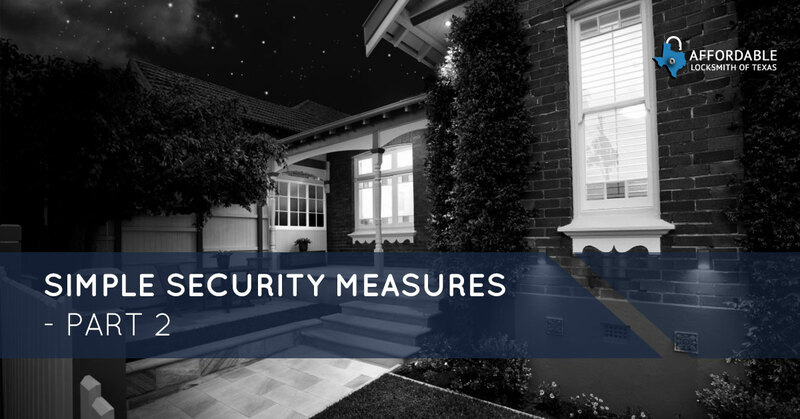 In our last several blogs, we have been discussing basic home security: the ways in which our locksmiths can help you keep your home in The Woodlands safe, and how you can do your part. First, we suggested that you check your locks for functionality and if you need to replace them or simply give them a little love with some simple maintenance. Also, we suggested installing electronic locks so you can deactivate keys when you need to and know exactly who has access to your home. Thirdly, we suggested that you rekey your locks if you don’t know where all your keys are or if you are not the first owner of your home. Lastly, the locksmiths at Affordable Locksmith of Texas wanted to ensure you that when you call us for your security needs that you will be working with professionals with integrity, expertise, knowledge, and the tools to get the job done right. By working with our licensed locksmiths you can rest easy knowing that we truly want to help you have the best security possible. Practical security measures that we suggested for your home in The Woodlands in our last post included locking all your locks of your home including your doors, windows, garage, and balcony. We also suggested that you leave a light on so that it appears that you are home to deter vandals: You will have a clear view of your home ensuring that you are the only one in your home. This week we are going to discuss a few other practical means that you can implement to increase your security. Leaving a light on for some may not sit well due to their consideration of the environment and the cost of energy bills. We completely understand these reasons for reluctance: If you are not going to be home until the end of the day, that is quite a long time to leave your lights on. Instead of opting for no light at all, why not invest in home automation. The capabilities of each system differ, but generally you can expect to be able to set your lights to turn on at a certain time or turn them on remotely, thus saving energy and money. Though installing a home automation system may at first be a little pricey, the advantages far outweigh the initial cost. Don’t make a big show that you are going on vacation. Pack quietly and never post on social media about your vacation before your return back home. We hope that these simple tips for keeping your home safe are helpful not only in their purpose, but in helping you feel safe. Always know that we, as your local locksmith of The Woodlands area are always here for you when you want to better your security and when you are locked out. Learn more about us on our website! New clients get 10 percent off their first service!